I am writing this letter in regards to Francine Vale. I have been fortunate enough to know Ms. Vale for the past five years. She is a very loyal, kind, and compassionate person who will go out of her way to help others. She had helped me with a painful deformity of the foot and toe by using emotional and spiritual practices to help alleviate my pain. Then she went even further by taking the time to help me find a vendor to build an orthotic for my feet. She knew I suffered and cared when no one else did. Very few people that I have known are willing and able to be as kind and caring as she has been to me. I have had the privilege of knowing Francine Vale for over 4 years, first as simply my neighbor down the hall in our apartment building and then as my dear friend and loving, gentle angel healer. She is an extremely kind and pure person and has been an extremely loyal and trusted friend to me, the kind of person you can always count on and deserves only the best life can offer. Her compassion combined with her healing skills and her determination, not to mention her many talents and interests, has helped Francine excel in her life, especially now as she pursues her career as a healer. In working with Francine, I have observed that she always maintains the highest degree of standards and values. I find her not only to be meticulous and professional in her work but what sets her apart from most others is her compassionate and loving style. She always presents herself in a soft low-key manner as she seeks guidance and wisdom from her own angels and guides. I have been in the investment business for over 20 years: 13 years at JP Morgan and 6 years with a hedge fund I co-founded and co-managed. Throughout my life both personally and professionally, I have never met a person like Francine. I have found her to be altruistic in all maters, small and large, empathetic and attentive, and a generous person, with a genuine interest in all people. I have benefited in so many ways from her healing powers during our sessions. Whether it was stopping the bleeding from a cut, alleviating back pain, or diminishing a rash on my leg, Francine has ways been there for me, happy and anxious to help me feel better. Not only has she helped me physically, equally important, Francine has helped me spiritually. Through her words, soothing calm voice, and the wisdom and knowledge she shares with me, Francine has enabled me to become a stronger, better person. And I have learned from her how to call upon my own angels and guides to ask for help when needed. Her outlook on life and helping people seems to be always optimistic. Francine is extremely dedicated, a leader and self-motivator, all wonderful qualities. I know that during her visit to Japan she would be a tremendous asset in helping people and would be a wonderful addition to your community. Thank you so much for showing me the light and your healing energy. After a couple of your sessions, I have become more in tune with everything going on around me. People respond to me differently. My physical, emotional, and spiritual challenges became lighter and easier to manage. The depths of my soul were healed by your touch. I thank you for the love you have given me, for your healing light, and for helping to reveal parts of me that I didn’t know exist. You are an amazing person – one that I would recommend to all my friends. The past five years I had numerous in-person and distant Light-Energy sessions with Francine Vale to facilitate healing back pain, depression/anxiety and a sleep disorder. Francine’s high ethical standards, loving presence and devotion create a safe and comforting environment, enabling me to receive her powerful healing abilities. During her sessions my energy begins to flow more freely, my sense of relaxation increases, and I generally feel more expansive. Francine’s healings have enhanced my well-being. Our enlightening spiritual discussions continue to reflect her wisdom and are always inspiring. Francine Vale is a wonderful, healing soul. She is compassionate and loving, and extends herself to you as soon as you come in contact with her. In my case, she intuitively knew the cause of my sleep apnea and worked with me on clearing and healing the cause. We talked about the relationships and beliefs I have that underlie how I function today. After two sessions Francine led me on a karmic healing voyage where I connected with my Mother’s spirit and communed with her. In the past I had always seen my Mother as hard, sometimes unkind, and sometimes jealous of me. In this experience I visualized her as a completely different soul, and it totally changed my perception of her. I saw her as young. beautiful, innocent and a friend, and this was quite a healing event for me. Since then, I have been seeing her in this way and it has allowed me to be more open to working in a healing relationship with her. Thank you, Francine for caring, and also for taking the time to follow up with me after our work together. From the first moment I met Francine I felt welcomed and at ease. I didn’t know what to expect. She conversed with me about my reason for being there and my expectations. She was soothing, comforting and assertive during our conversations. Francine is a powerful, gentle, generous and wise person. I’m very lucky to have met her. Her healing capacity has assisted me in dealing with very difficult situations and people. My experiences during her healing sessions were very spiritual and awakening. Francine transpires a sense of hope, tranquility and love. I got the feeling that one is never alone and that everything has a reason to exist. I learned that what I go through in this life has a high purpose and opens the door to spiritual growth. I sincerely recommend Francine. She a a spiritual jewel. I feel truly honored that I have received the healing work of one of the rare healers through so many in my life. Francine is a real sincere soul and her healing work is so profound and phenomenal that when she was working on me from NY to Santa Clara, CA, I was feeling the heat so tangibly on the spot that she was working on. She has such a loving and generous heart, that you can feel it right away as soon as you hear her voice on the phone without meeting her, you feel the ocean of love pouring into your heart. I have recommended her to all my friends and all are agreeing with me in her profound healing work and her uniqueness in her unconditional love toward all and her generosity. I wish her the best in life. I have known Francine for twenty years. I have always found her to be a calming and peaceful influence on my life. Five years ago, I had breast cancer, three surgeries and a year of chemotherapy and radiation. Francine came to my home and taught me to meditate. She did several peaceful healings on me. The ability she transferred to me got me through the ordeal. I strongly believe that there are some people put into your path because you will need them. Francine and I met through our daughters. When my daughter moved to New York City, Francine was the only one to call me and offer to help Kim if she needed a doctor, dentist or just some friendship when she was lonely. At about the same time I was going through the breast cancer thing, my son-in-law, Kim’s husband, was killed in a car accident. Francine saw me through many black hours and always managed to transfer her spiritual trust to me. One day, after a session with Francine, I was really open spiritually and I saw Joe — only for a moment and in an outline. I never told anyone because some people think this is crazy. Francine started a group to practice meditation and several nonbelievers came to sessions with us and found peace and calm. She healed me heart and my soul. She has healed my husband’s knee. He is a Doctor, a General Surgeon and he believes in her ability. Whoever has the opportunity to be helped by her is a very lucky person. I wanted to tell you again how much your healing helped my knee. It was much more effective that the physical therapy the doctor recommended. The swelling was reduced and the pain greatly diminished. I think you know I brought a degree of skepticism to our session so I am convinced that it was NOT the power of suggestion that stimulated the improvement. You have a precious gift and I would not hesitate to recommend you to anyone who is in need of healing. Thank you for using your healing powers to cure my cellulitis. After having breast cancer surgery, I was suffering from cellulitis which was a result of the surgery, and very painful. Upon meeting with you for a short period of time I realized the next morning that I felt perfectly fine and attributed it your healing powers. Thank you so much for spending time with my Mother and I on Saturday. We both found the session to be tremendously beneficial on so many levels. The insights and wisdom which you conveyed will stay with us and will serve as a useful guide as we go about out daily lives. Listening to your inspirational words as we sat in your beautiful apartment, with the sun streaming through, made the experience all the more special. Many, many thanks, once again. I wanted to thank you for the care and wonderful experience you gave me. There have been many changes and I have shifted into becoming more aligned with the source of my power and creative force, you have enabled me to control events in my life by transmuting the sadness and aniexty into confidence and joy. I love being with you. Your energy is so clean, pure, refined and inspiring to be around. I take so much with me when I leave, even the feeling of your apt. lingers with me for days. It is such a reflection of who you are. You are such a beautifully evolved spirit that I admire and respect. You are a wonderful influence in my life! Your natural magic is contagious. The most fun thing is how we meld in thought and conversation – we seem to validate each other. We are quite complimentary. I hope to keep in close contact with you. You can call anytime and love my company as you wish. I even dare to say I am looking forward to co-creating something with you. You know the architect in me! So, I am at the part of your book where you are in your house on Flower St. I have to tell you that I believe what is happening for me as I read your life story, it is bringing up so much for me and layers and layers of old memories are coming up to be looked at and healed. While I didn’t have the exact same things happen to me, there is a similar theme and patterns that you experienced that I also experienced in my life. I’m not sure if others reading your book feel your life as deeply as I am feeling it. This is experiential for me. There are many times I have to put your book down and just cry. My heart aches for what you have lived through. It just makes me love your strength and perseverence even more. I continue to see, feel, and hear your life story even after I have put your book down. I’m sure that’s why spirit encouraged you to write the way you have written this information. It’s to come alive for those who read it. You are an amazing Mother. I wish I had been half the Mother that you are. Also, having met you at a time when you laid your husband to rest, I find it interesting to learn about his life and how he treated you and his family. I thought my mother-in-law created havoc in my life and was difficult….it’s nothing compared to how you were treated by your in-laws. Francine, I am learning so much about how to look for the golden nuggets in life no matter what has been tossed your way through your experience. What a lovely gift. I wish I had lived close to you and had been able to be a friend to you earlier in your life. I’m so glad I met you and I am looking forward to see how everything continues to unfold. You are having quite an impact on my life. Big hugs and happy Monday to you! Thank you for sharing your life. If you are not accustomed to witnessing miracles, chances are you haven’t had the privilege of knowing Francine Vale. I first met Francine in 2010 when I attended one of her Angelic Healing Circles. And that’s all it took to keep me coming back month after month. Her loving presence, her kindness, her words of wisdom, her channeled meditations and messages uplifted my spirit. Whoever needed a healing, whether it be physical or emotional, was invited to sit in the center of the circle and she would pour out loving energy, and it was palpable. We all hated to leave and would prolong the evening as long as we possibly could. In June, 2012, my daughter suffered a severe head trauma. Knowing that she is a powerful, powerful healer, I called on Francine for help. From the hospital at 11:30 p.m., I called her hysterically crying, and relayed the doctor’s prognosis—severe bleeding and bruising in the front lobe of her brain, possibility of swelling which would necessitate inserting drainage tubes, possibility of permanent brain damage, the list went on and on. In addition to the head trauma, she tore ligaments in her neck requiring her to wear a neck brace until they healed so that her spinal nerve would not be severed from moving the wrong way. Small miracles also happen in Francine’s presence. Like recently when I attended a healing workshop she held. That same day my daughter had gone into the city with some friends to attend a vegan food festival. Her friend had an allergic reaction to something she ate. My daughter called asking for advice. Right after the call, our group meditated and sent healing energy to her friend. Not more than 10 minutes later, my daughter texted me advising that her friend was feeling better and everything was fine. Shortly afterwards, we did another exercise where we were to send loving energy to someone whom we felt needed it. Francine guided us through the exercise and told us that shortly afterwards we would hear from the person to whom we sent the energy. I sent energy to my daughter. Exactly 30 minutes later I received a text message from her saying “I love you a lot Mom.” I shared it with the group, and we were all amazed and teary eyed. If you ever have the opportunity to hear Francine speak or attend one of her workshops, by all means go. Go with an open mind and an open heart; you will not be disappointed. Read her book, Song of the Heart: Walking the Path of Light. Study the chapter on the “Structure of All That Is.” Francine truly is surrounded by angels, and she teaches about their presence to everyone who is willing, and even not so willing, to hear. Her message of loving kindness and oneness never falters. She is one of those rare, rare individuals who always expresses from the higher realms of consciousness. Thank God for people on this planet like Francine Vale. With her open heart, her open mind and so many lessons to teach us about how beautiful it can be to be human here if you keep your life fluid. And how sometimes things we can’t see, she teaches us are the most important.” Her book, “Song of the Heart: Walking the Path of Light” is a book that will open your heart. Francine Vale’s book, “Song of the Heart: Walking the Path of Light”, took me on a deep journey, one in which had me identify a lot with some of my own family dynamics. Her story is such a testament of someone taking their own experiences and creating them into good and being of service. Her book is not only healing but also had me see that there is a healer in each one of us if we allow ourselves to remain open. I’m so thankful that she took the time to share her life with us on an intimate level. Francine is a gift to the world. Francine’s memoir and life journey is truly fascinating! She shares how angel spirits impart their life-earned secrets and guide her toward her true calling and what she was put on this earth to do: become a spiritual healer, spreading the message to open our hearts to others and ourselves. To walk the path with Francine Vale is to know the ever-present glow of the angel’s wings, for Francine does not walk alone. She brings with her luminosity and absolute love—and, if you’re ready to be embraced, she will impart those to you, too. 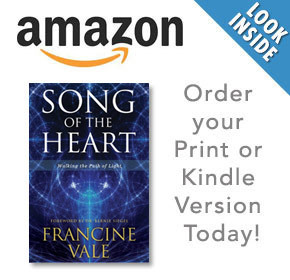 Beyond the intellect, beyond the comings and goings of the transactional world, beyond even the mind, the message of “Song of the Heart: Walking the Path of Light” is one of love, of letting go of fear, of healing, of experiencing the joy of free will and the intangible insight of the divine. Open and unfold the heart, and in its abundance, see the message Francine is conveying. It is for everyone. It is all.